Green Smoke offers a limited lifetime warranty. If your battery goes dead within the first year, you can get a free replacement. After that, you are entitled to 3 additional replacements, so long as you keep buying cartomizers from Green Smoke. My favorite pro of all is the free shipping that applies to any order over $25. I never spend less than $100 on cartomizer replacements, so I basically never-ever pay for shipping with them. The key obviously is to always spend at least $25. I could careless about this one, but you'd like, you may order 'fancy' designer batteries like the Cooperstown or New Orleans. They're more expensive, but they feature "eye-catching" designs that I guess are supposed to make you look cool. I haven't tried other brands, so I cannot say this for certain, but many Green Smoke users claim it produces thicker, more flavorful vapor than alternative cheaper brands. And the benefit is that more vapor allows for a more realistic smoking experience. 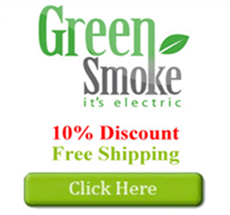 Green Smoke is unfortunately one of the most expensive electronic cigarette brands in existence. It personally cost me a tad over $100 to get started. And it still costs me $100 in cartomizers every month. Mind you, I used to spend $200/month on cigarettes. This annoys me, but basically, not all cartomizers are created the same. With every batch I buy, I always get 1 or 2 dead on arrival. And there are always 1 or 2 that just vape really badly. It's annoying, but most of the carts work, so I haven't really complained too much about it. To learn more, please look here.